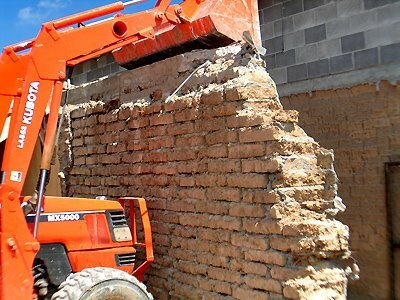 Yesterday afternoon, several miles south of Mesilla, I watched the last wall of an adobe structure pulled down. There were several good reasons the old home had to be demolished, including public safety. I spoke with the owner, who told me the structure was not that old, having been built about 1950. Notice that the mortar used between the adobe bricks is cement. That is a practice that began in the late 1940s and largely defeats the advantages of adobe, because cement is an excellent conductor of heat. 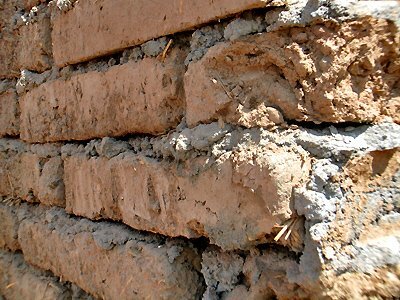 An adobe structure that uses cement mortar instead of the traditional mud will be hotter in the summer and cooler in the winter.